UNITED NATIONS, Sep 13 2017 (IPS) - As hundreds of thousands of Rohingya Muslims flee violence in Myanmar’s Rakhine State, thousands that remain in the country face mass atrocities at a scale never seen before. Since the renewal of violence on August 25, sparked after an armed group known as the Arakan Rohingya Salvation Army (ARSA) attacked security posts, over 370,000 Rohingya Muslims have fled to neighboring Bangladesh and thousands more remain trapped at the border. “This is the worst situation ever that I’ve seen and I’m afraid it’s going to be the worst situation that the international community will witness in such a short period of time,” UN Special Rapporteur on Myanmar Yanghee Lee told IPS. As thousands flee violence and persecution, Lee expressed particular concern for the fate of Rohingya that still remain within the country. Though Myanmar has repeatedly denied abuses since it launched its counterinsurgency operation against “extremist terrorists”, many say that the Rohingya community have been systematically targeted as security forces raid, attack, and burn villages. 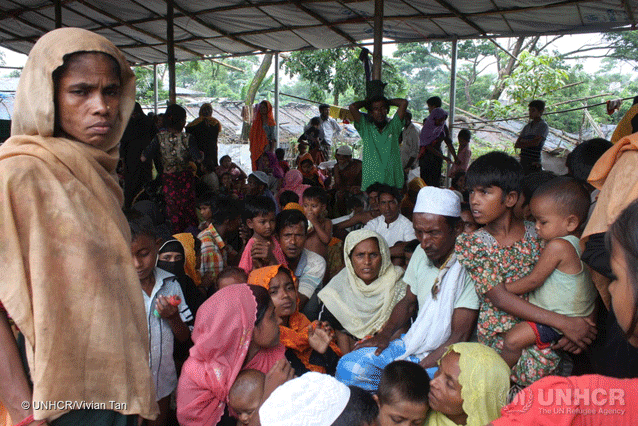 Momena, 32, told Human Rights Watch that she fled after seeing security forces enter her village. Returning after the soldiers had left, she saw up to 50 villagers dead including some children and elderly with knife or bullet wounds. “My father was among the dead; his neck had been cut open. I was unable to do last rites for my father—I just fled,” Momena said. Yasin Ali, 25, said that security forces similarly attacked his village, shooting indiscriminately and forcing residents to flee. He told the organization that a helicopter which circled the village dropped an object after which houses caught fire. Using satellite imagery, Human Rights Watch has identified 21 separate sites spanning 100 kilometers across northern Rakhine where fires have taken place. One such image shows the destruction of 450 buildings in predominantly Rohingya-inhabited areas in Maungdaw while other parts of town remain unharmed. The Rohingya Muslim village of Chein Khar Li in Rathedaung township was also found to be almost completely destroyed with 700 buildings burned. Lee told IPS that she came across similar accounts during a fact-finding mission after the October 2016 violence when Myanmar’s military conducted a counterinsurgency operation in response to attacks on border posts. The Office of the High Commissioner for Human Rights (OHCHR) found that hundreds of Rohingya houses, villages, and mosques were deliberately burned down with one eyewitness noting that only Buddhist houses in her village were left untouched. The government rejected these allegations then, telling Lee that it was villagers who had burnt down their own houses, an explanation that the government continues to use for the current burnings. With bellowing smoke from burning villages that can even be seen from across the border in Bangladesh, Human Rights Watch’s Deputy UN Director Akshaya Kumar told IPS that the scale of this year’s violence is much more expansive, noting that the area being burned is five times longer than the area previously and similarly affected by burnings during the violence in October 2016. The High Commissioner for Human Rights Zeid Ra’ad al-Hussein said that the treatment of Rohingya Muslims seems to be a “textbook example of ethnic cleansing.” He called on Myanmar’s government to end its “cruel” and “disproportionate” military operations and to “reverse the pattern” of discrimination against the Rohingya population. While facing the direct threat of violence, many who remain are also facing a severe food and health crisis. Prior to the eruption of violence, Myanmar’s government blocked international aid agencies and cut off all assistance to Rakhine, restricting access to residents. World Food Programme (WFP) reported in early September that it has not been able to distribute food to a number of locations in northern Rakhine since mid-July, leaving a total of 250,000 displaced and vulnerable populations without regular food assistance. “Thousands, perhaps tens of thousands, may be trapped in remote areas far from the border with limited food and medical supplies and are unable to reach safety,” Office for the Coordination of Humanitarian Affairs’ (OCHA) Myanmar Spokesperson Pierre Peron told IPS. Rohingya in Rakhine State had already long faced food insecurity before violence broke out with child malnutrition rates above emergency thresholds. According to a WFP assessment in July, one-third of Rakhine’s population was severely food insecure and in need of humanitarian assistance after the October 2016 violence. Over 80,000 children were expected to be in need of treatment for acute malnutrition within 12 months. The current lack of humanitarian assistance has therefore only served to compound an already dire situation. “Without regular access to aid and with severe restrictions on the freedom of movement of thousands of people, any disruption in humanitarian aid has a very real human impact,” Peron said. “For the sake of vulnerable people in all communities in Rakhine State, urgent measures must be taken to allow vital humanitarian activities to resume,” he added. In Central Rakhine, where there have been no major violent outbreaks, heightened tensions have impeded life-saving activities. Contractors have refused to carry food and other services to displacement camps for fear of retaliation from the wider community for helping the Rohingya population and aid agencies. Kumar said that the reports are not surprising, especially after State Counsellor Aung San Suu Kyi’s office accused international organizations of assisting militants. “We have seen a huge and incredibly irresponsible push by the government including from Aung San Suu Kyi’s office saying any aid workers that provide support to this community as indirectly supporting terrorism. And that of course treats everyone who happens to be of this ethnic group as a terrorist,” she told IPS. 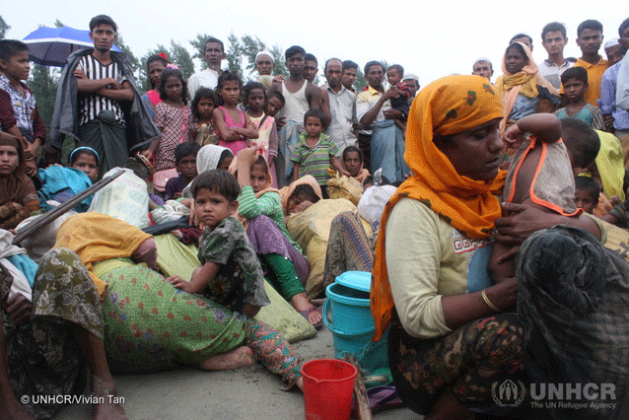 “As politicians fan the flames of xenophobia and mobilize communities against the Rohingya population with rhetoric about terrorism, these displaced Rohingya are at special risk—they have no one to protect them,” Kumar added. Lee urged the military and ARSA to restrain from this cycle of violence as it is the innocent civilian population that end up suffering the most. “This is a crisis that could have been prevented and should never have happened,” she told IPS. Lee highlighted the need for a political solution, including the provision of citizenship to the stateless population. However, there seems to be no end in sight yet in the crisis as the Southeast Asian nation rejected a temporary ceasefire proposal from ARSA. Kumar called on the Security Council, which has so far remained silent, to send a clear message and an unequivocal condemnation of the government’s actions. The group met behind closed doors in late August to discuss the crisis but did not issue a formal statement. Another closed-door meeting will be held on Wednesday. Kumar stressed the need for an open meeting to demand actions and threaten measures such as sanctions so as to hold Myanmar’s government accountable. “If we continue to have silence, inaction or mealy-mouthed statements, then unfortunately this crisis could continue maybe until we are in a position where there aren’t any perceived threat or Rohingya left in the country,” she told IPS.